In many Boston restaurants today, one can find Scrod on the menu. Is scrod cod or is it haddock? Scrod or Schrod, is actually both. For generations, the origin of the term scrod has been widely debated. The earliest cook book that was researched was The American Matron; or, Practical and Scientific Cookery by "A House Keeper" (1851). The Broiled Scrod recipe states: "Take a small cod and split it, or the tail of a large one; sprinkle it with salt, and it remain overnight. In the morning, wash off the salt, and wipe it dry. Rub a little lard over the grid-iron, and put on the fish, skin side down, and let it broil gently for one half hour, then turn it over, to brown the other side. When served, rub a little butter and a little pepper over it. Serve hot." According to The Boston Cooking-School Cookbook by Fannie Merritt Farmer (1921), the definition of scrod is: "A young cod, split down the back, and backbone removed, except a small portion near the tail, is called scrod. Scrod are always broiled, spread with butter, and sprinkled with salt and pepper. Haddock is also dressed." What is the true origin of scrod? Scrod may have derived from the obsolete Dutch word "scrood," which meant "small cut off pieces." In the October 16, 1841 issue of Spirit Of Times, a presumed sailor was served dried scrod. If a large cod was cut up into many smaller pieces, and then dried and salted, such a serving could be considered a "piece cut off." Contradicting the above assertion, there are 1850s references that state scrod was transported as cargo on ships, implying that the size of a single fish may have given it the attribution as scrod. In English, referring to A Dictionary of the English Language by Noah Webster (1857), "scrag" is defined as "Something thin or lean with roughness. A raw-boned person is called a scrag; but the word is vulgar." Scrag was derived from the Dutch word "scraghe" which meant anything "thin or lean." Similarly, the English word "scrimp" is defined as "To contract; to shorten; to make too small or short; to limit or straighten; as to scrimp the pattern of a coat. New England. [Various dialects in New England] a. Short; scanty." Thus, a scrimp is something small. The average cod caught in the 1850s was likely around ten pounds in weight, while a "scrod" weighs under three pounds. Complicating things even further, the obsolete English word scraw was possibly still in use, which had derived from the Gaelic word "sgrath," and meant: "a thin sod, (divot); what covers the kiln of grain; — scum; rind." In the 1830s in Ireland, scrawed meant sod placed somewhere, as a "a scrawed thatched roof." The outer skin of a cod is a greenish brown which is cut, while noting that a large number of Irish people emigrated to Boston in the 1850s, of which many presumably became fishermen. Scraw also existed in the Cornish language, and represented a method of cooking. According to Notes and Queries: A Method of Inter-communication, Volume 10 (1854): "Fish are 'scrawed' when they are prepared in a particular way for cooking. This scrawing consists in cutting them flatly open and then slightly powdering them with salt and sometimes with pepper. They are then exposed to the sun and air, that as much as possible of the moisture may be dried up. In this state they are roasted over a clear burning coal or wood fire. Thus prepared and smeared over with a little butter they are said to be scrawed." In the book Life of Daniel Webster, Volume II, by George Ticknor Curtis, p.664 (1871), it states: [Webster's friend] liked cod fish best—he liked to have them scrawed—to have them split open, corned a little over night, and broiled for breakfast." Scrod also appears to have been used in a vulgar manner in describing a young woman. In Newfoundland and St. Johns, New Brunswick, there are newspaper references to "scrod-girls" in the early 1840s, very likely offensive to women [a young fish kept overnight.]. Scrood - Not all cod were merely "cut up pieces" of fish, as newspapers reported scrod as cargo in the 1850s. Scraghe or Scrag - A 3 pound cod is not lean and not rough, it is just much smaller than an average cod. Scrimp - Scrimp could be used as an adjective to mean short and scanty, such as "what a scrimp that cod was" or "what a scrimpy cod." Scraw (Gaelic) - The word was not in use anymore in English by the 1850s according to Webster's Dictionary (1857). In Gaelic, scrawing meant to place sod somewhere. Scraw (Cornish) - Described as a method of preparing and cooking a fish that matches an 1851 cook book recipe labeled "broiled scrod." There are other references to splitting fish and then drying them to be broiled later (scrawing). Also, the January 21, 1846 Boston Atlas has an advertisement for dried apples, "scrawed into rum barrels." This editor deduces that the word Scrod derived from the combination of Cornish Scrawed + Cod. Note that Schrood was also a German word (1750s) that meant to lay flat and slice. Scraw likely derived from obscure German. The first interview was with a couple of young men known to have had considerable association with the briny mighty, as amateur yachtsmen and fishermen. "Scrod," replied one, "is a small fish that is chock full of bones." "You're completely off, my boy," chimed in the second. "To be sure, at Crescent beach they served a little fish no bigger than a perch, and just as full of bones, for scrod; but the real thing is a large flaky fish having absolutely no bones at all." 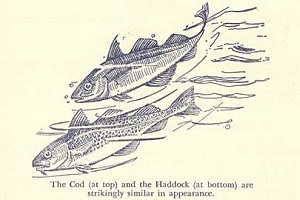 A native of Penobscot bay, on the Maine coast, who was interrupted in the middle of a recital of how he recently caught over 100 pounds of cod and haddock in an eight hour day, declared that he had never heard of the word scrod mentioned among Maine fishermen, or anywhere else, excepting at the banquet board. He had not the remotest idea what scrod is or where it comes from. What is evidently a cape Cod interpretation of the term was obtained from a native of the sand dunes that were once the stamping grounds of the pilgrims, and one who has lived all his days in the atmosphere redolent of the odor of the deep sea fish. "A scrod," said he, without a moment's hesitation, "is a flounder prepared for the broiler. The fish is split in two thin layers, just as a shoemaker would split a piece soleleather; the bones are deftly extracted and then it has cease to be flounder and ranks as scrod." The next authority consulted is a veteran of many a voyage to foreign climes, who was presumed to know some of the mysteries of the deep, as his published stories of life on the ocean wave have thrilled the blood of many American youth. He wasn't phased for a moment by the question, but answered with the nonchalance of a man who believes what he is talking about: "Why scrod is a measly little soft and flabby fish that is just about no good for any earthy use." "I never saw one myself. You don't find them in the market very often, but the codfishermen bring them in once in awhile, like such other freaks as sculpins and dogfish. "There used to be a little bit of an insignificant tugboat in the harbor that was universally known as the Scrod. That will give you a very good idea of the peculiar characteristics of the fish. A retired fisherman who learned his business off the Irish coast, 70 years ago, and who for 25 years deprived the waters of Massachusetts bay of their finny treasures for the Boston market, smiled indulgently when requested to settle the point. This was his explanation: "Anything under three pounds that is ordinarily to be found in the catch of the deep sea fisherman is called scrod—that is, anything excepting mackerel." A large wholesale fish establishment on T wharf was next invaded, and a man growing gray in the business was interrogated. "What is scrod?" he repeated musingly. "Well we call codfish, say, under 2 1/2 pounds, scrod. I believe there is a specific kind of fish by that name, but I never came across one yet." Then accosting another veteran who had just entered the office, he asked: "Bill, is there a distinct variety of fish called scrod?" Bill rubbed his unshaved chin for a moment and then replied: "No, scrod is anything of the cod, hake or haddock variety, under two or three pounds." At this stage of the investigation it had become apparent that the term scrod had a decided elasticity of interpretation among the fishermen, as well as with those whose acquaintance with the article goes no farther than an appreciation of its excellence upon the menu, yet it seemed to be fairly clear that a codfish of three pounds or less is a scrod. The next expression of opinion was from one of the best known retail fish dealers in Boston, who remarked, with the air of a man who is disgusted with the ignorance prevailing about him, "The word scrod simply indicates a certain way of dressing and cooking a codfish." "That is scrod there," he added, pointing toward a big platter on which were displayed half a dozen cod, perhaps 1/2 inches long and of two pounds weight, split open and flattened out, exactly like an old-fashioned salt fish, save that all bones had been carefully removed. From a retailer in Quincy market, who does a large hotel and family trade, it was learned that scrod is a cod or haddock of less than three pounds, which that particular establishment does not handle. The kind of scrod they deal in is ordinary market cod or haddock between four and eight pounds which has been "scrodded" by the manner it is split open and dressed. "Even a 50 pound fish is a scrod, if dressed in a certain way," declared the salesman. He added, "it is astonishing how many people ask for scrod, without knowing what it is. We ask them, "Cod or haddock?" They insist that they want scrod. We explain that it's all in the dressing, and they are perfectly satisfied with cod or haddock then." The nestor of hotel head waiters in Boston, when asked to contribute to the scrod symposium, thought long and deeply, and even then said "A scrod is a codfish not over four pounds, split open down the back, cleaned and deprived of all bones, and then broiled. The flesh of a fish larger than four pounds would be too thick to broil well. Upon being informed that a dictionary definition of scrod is a young cod for boiling of broiling, he said, "I never heard of boiled scrod. I about never think of asking the customer he wished it boiled or broiled. It must be broiled or it can't be scrod. If boiled, the fish is simply boiled cod, no matter how small it may be." This veteran's recipe for the preparation and cooking of scrod is as follows: Having selected a fish of the right size, remove the head and tail, split open the entire length and remove the bones, then dip it in melted butter and afterward in crumbs. It is then ready for the broiler, and should be cooked mainly on the flesh side. If the fish is small enough it can be placed on the broiler whole. Otherwise it can be cut in two or more sections. The steward of the same hotel added a bit of interesting if not illuminating information when he explained that the hotel does not buy scrod, as such, it simply purchases codfish of assorted sizes, the smaller ones, say up to four pounds, being split for broiling or "scrodded," as the cooks called it, while the larger ones are prepared for frying or boiling, or for steak, as the case may be. Sometimes, he added, if the smaller fish don't hold out, a larger one will be selected, perhaps a five or six pounder, a section of the rear portion near the rest of the fish, being cut off for broiling. Thus, the body of a fish may go to the table as market cod, but his tail will become scrod. Several hotel cooks of the highest class agreed that scrod, as they understand it, implies the fish that has been either broiled or prepared for broiling. And those who have worked in New York or other cites, agreed that they never heard the word till they came to Boston. A former assistant steward of one of the leading hotels, now a successful restaurateur, described the scrod of the cuisine as simply the tall portion of an ordinary, codfish broiled. "I'll tell you another little secret," he added. "Fillet of sole, a choice dish among gourmets at high-class restaurants, is in this country merely a thin strip of cod or flounder, rolled up tightly and fastened with a skewer and then roasted. Sole is a fish found in the English markets." It is exceedingly curious that, in these days of exhaustive cook books, not one of the leading authorities of that kind has any mention of scrod, not even the latest publication, which is in two volumes, each one of them as large as an unabridged dictionary. It cannot be denied that authorities on the subject are numerous enough, yet if, having consulted the vailed views here collated, the reader can tell what scrod is, he deserves to be congratulated."